If you like solving mysteries and finding clues, Sherlock Holmes : The Hunt for Blackwood by IGT is the perfect way to engage in some serious sleuthing. So you can try your hand at Sherlock Holmes : The Hunt for Blackwood slots with 5 Reels and 30 Paylines. 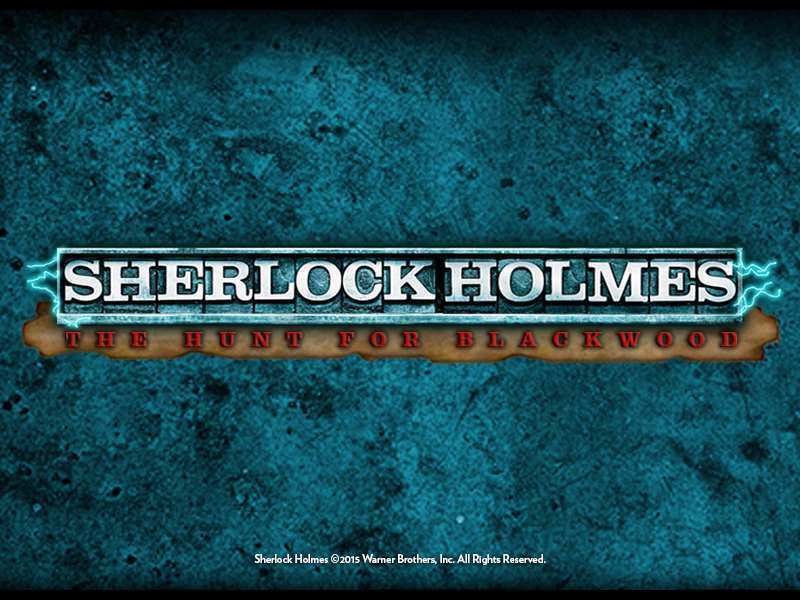 The game is set in UK where you enter 221 B Baker Street and find Holmes and Watson waiting for you to join them in this game which is based on the movie version of Sherlock Holmes. Assist them in solving the most intriguing mysteries and win lots of prizes in the process! So the main objective of the Sherlock Holmes : The Hunt for Blackwood Online game is to hunt down Lord Blackwood and get rewards along the way with multipliers, free spins and bonus wheels. Along with that is the opportunity to trigger bonus games that could lead to some major winning. With the Sherlock Holmes Robert Downey Jr. And Jude Law starrer movie being the main theme of this online slot game by IGT, it’s understandable that the symbols include Sherlock Holmes, Watson, Gladstone, Lestrade, Mary, violins and pocket watches and smoking pipes and magnifying glasses. The character symbols are the higher paying ones with the objects being lower paying. Random Multipliers – The base game is peppered with these multipliers which will reward you when you least expect it with a multiplier up to 10x on all wins. The multipliers usually come with wins on the lower paying symbols. The Pocket-watch – This seems to be a particular favourite with the multipliers. Stacked Sherlock and Watson symbols give some big bonuses as well with the screen filling up with upto 30 Paylines and 5 Reels. Also, the Sherlock and Watson symbols could combine into one symbol on any spin, leading to higher payouts. If you can trigger the Mystery Multiplier you can win upto 1000 times of your Bet! There are 3 bonus games that can be triggered. The Picker Puzzle game, The Hunt Bonus and the Blackwood Bonus Wheel. Triggering each is a multi-stage process and needs careful attention. The Picker Puzzle Bonus can be started by finding 3 of the Golden Cog bonus symbols on reels 1, 3 and 5. – The player is taken to Sherlock’s room where he/she can pick various items to reveal symbols. It is through this process that the next Bonus Games can be started. – The Blue Scroll starts the Hunt Bonus when 3 or more are found. – Finding 3 or more of the Purple Wheel symbols activates the Blackwood Wheel Bonus. The Hunt Bonus, getting activated rewards you with 10 free spins if 3 scroll symbols are found and 15 free spins if 4 scrolls are found. – The player is taken to a different reel set based on a map with 5 locations. – If a Sherlock or Watson symbol lands on one of the locations then it gets locked for the rest of the spins, getting converted to a wild. – If all five locations can be locked then the total winnings are doubled at the end of the game! The Blackwood Wheel Bonus is an intriguing and involving feature. Getting 4 instead of 3 Purple Wheels will give the player richer reels with bigger win potential from the beginning. – The challenge is to last out all 10 spins with your 3 Pointers alive. – The player must try to land on the cash symbols to win. – The Blackwood symbols are to be avoided as they deaden a Pointer landing on them. – The Sherlock symbols which appear from later spins serve to reactivate all Pointers if landed on. – Finally, if all 10 spins are survived it doubles the player’s wins at the end of the game! So, play free Sherlock Holmes : The Hunt for Blackwood casino slot machine for the best experience of online sleuthing and take away mind-boggling bonus prizes with real money to boot. Test your luck in this popular no download casino game, with its user-friendly interface. The winning chances are good and the multi-layered Bonus Games provide an added incentive, making this a popular choice for the gaming community. 0 responses to "Sherlock Holmes: The Hunt for Blackwood Slot"